The HURT family of Alderwasley. A great deal has been written elsewhere about the wealthy landowning family of HURT centred on Alderwasley Hall (now a school) 4 km East of Wirksworth. The HURTS were great landowners, timber suppliers, wealthy lead merchants and iron manufacturers. They were also Magistrates, Justices of the Peace, and Lieutenants of the county, and held high rank in the Army when it was officered by purchase. 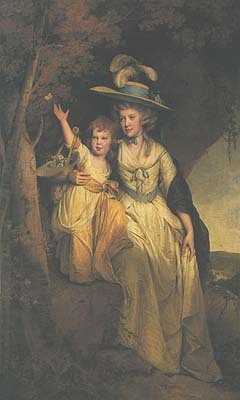 The family is ranked among the chief gentry of Derbyshire. Marriage into similar families was all important. John Lowe, sheriff of Derbyshire in 1679, died without issue and Elizabeth his sister and heir carried the manor of Alderwasley and the other estates of the family in marriage to Nicholas Hurt, of Chasterne, in Staffordshire, esq. whose son, Charles Hurt, esq. was sheriff of Derbyshire in 1714, as was Nicholas Hurt, esq. 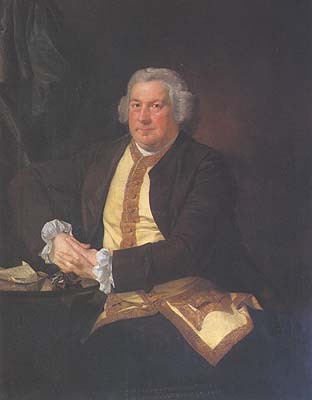 son of Charles, in 1756; Francis Hurt, esq. (son of Francis) (and nephew of the last Nicholas) in 1778, whilst his father was living; which Francis, the son, was (February 1797) owner of this a manor, and of a considerable estate, viz. 3149 acres therin, partly derived from his ancestors, the Fawnes and Lowes, and partly from the purchase of his father and others of his family from Nathaniel Lord Scarsdale, and others at different periods. The occupants of Alderwasley Hall can be traced in the following Census returns: 1901, 1891, 1881, 1871, 1861, 1851 and 1841. Dates and relations taken from Wirksworth Registers, IGI and the tree below. A very large amount of information about the family can be found in that most excellent book "The Hurts of Derbyshire" by Derek Wain ISBN:1-84306-042-6, 192pp. 1711       |      1714        the Hall and contents were sold in 1929 due to Estate Duty. can be seen on Alice's photos. She was unmarried. ALDERWASLEY, (Allerwaslegh, Alerwash), 2m. E. of Wirksworth, 3m. S. of Cromford, 6m. N. of Belper, and 14m. N. of Derby, is a scattered village, township and chapelry, in the parish of Wirksworth, deanery of Ashbourn and hundred of Appletree, containing 80 houses, 80 families, and 454 inhabitants. Sixty-two families are employed in agriculture, 17 in trade, and one independent. There is an iron forge, conducted by Messrs. Mold and Co. and a corn mill. There are 3024 acres of gritstone land in this township, of various qualities, 700 acres of which is wood land. The average rental is about 17s. per acre, and the estimated annual value of the buildings and land amount to £2775. 11s. There are five freeholders who own about 237 acres, the remainder is the property of Francis Hurt, esq. The tithes belong to the dean of Lincoln, who has leased them to G. H. Errington, esq. the latter gentleman re-lets them to Mr. Hurt. The average poor rates and other parochial expenses for the last nine years are £239. 19s. 10d. per annum. Mr. Hurt holds a court annually. The steward of the court is Charles Clarke, esq. of Derby. A decree in chancery was obtained, 19 Elizabeth, by William Blackwall, of Steeple, county Derby, gent. John Storer, and Richard Wingfield, of Alderwasley, copyholders of the manor, for themselves and others, against Edward Lowe, esq. In consequence of which decree, the lords of this manor are not entitled to heriots, nor more than one year's improved rent on admittance of a customary tenant by descent or purchase. There are two Sunday schools; one is supported by Mrs. Hurt, the other by Miss Watkinson, of the Forge. The Wesleyan Methodists have a chapel here. Alderwasley and Ashleyhay form a joint constablery. From Alport hill and Alport stone, near the village of Spout, it is said the Wrekin, in Shropshire, may be seen on a clear day. "Though Alderwasley is parcel of the hundred of Appletree, yet it is within the parish of Wirksworth, the site of which is in the hundred of Wirksworth. The name is compounded of Alder (the Alnus or Alder tree) wash (a watering place) and ley (a pasture). Its situation is in the northern angle of the hundred. Alderwasley, Milnehay and the whole of Ashleyhay (excepting two farms in Ashleyhay, the property of P. Gell, esq.) form one manor, and are bounded by the lordships of Crich and Belper on the east; by the lordships of Belper and Shottle on the south; by Alton on the west; and by Wigwell grange and Wirksworth on the north. "Alderwasley is not mentioned in the Doomsday Book; being probably at the time when the record was compiled, accounted part of Belper, a dependant manor of the great fee of Duffield. William de Ferrars, Earl of Ferrars and Derby, and lord of the manor of Duffield, had a charter of free warren in his demesne lands here, in the 36th year of king Henry III. The estates of the family of Ferrars passed to the house of Lancaster under circumstances which will be fully spoken of in the history of Duffield. By the extent taken of the lands which were of Edmund, Earl of Lancaster, the king;s brother, in anno 26 Edward I. it is found that he had in Alerwash £20. 7s. 6 1/2d. per annum of rents of assize, of free and other tenants at will and by the custom; and there was also a certain mill of which the lord received annually 60s. : he had also other revenues, the description of which is obliterated in the record, worth one year with another £15. ; tallage of his customary tenants to the amount of 60s. per annum; ancient fines at his two great courts amounting to 10s. per annum; and pleas and perquisites of courts worth per annum 20s. And the same year Allerwaslegh, as a member of Duffield, was assigned to Blanche, queen of Navarre, widow of Edmund, Earl of Lancaster, in dower. The manor continued parcel of the possessions of the earldom and duchy of Lancaster to the time of king Henry VIII. who (20th March, anno reg. sui 19) granted it with all his lands, tenements, rents, reversions and services in Alderwasley and Ashleyhay, parcel of his duchy of Lancaster, to Anthony Lowe, esq. and his heirs, to hold by the yearly rent of £26. 10s. and fealty only for all services. Out of this grant arose a noted cause which was argued in the court of Wards, Trin. term, 7 Iac. I. and which is reported, by Sir Edward Coke, under the title of "Anthony Lowe's Case." Anthony Lowe, before the grant above mentioned, held lands in Alderwasley, of the manor of Alderwasley, by knights' service, and suit to the court of the manor of Bewraper (Belper) from three weeks to three weeks, of which manor of Bewraper the manor of Alderwasley was parcel; and the whole being parcel of the earldom and duchy of Lancaster, and being, before the manors came to the crown, held of the king in capite by knights' service. Lowe held also of the manor of Alderwasley a capital messuage, &c. &c. in soccage, by fealty and the rent of £3. 11s. And Lowe being so seized, the king, by his letters patent under the duchy seal, 22 June, 15 Henry VIII. granted to Anthony Lowe (ancestor of Anthony Lowe the plaintiff) and to his heirs the said rent, and ratified the estate of the said Anthony in the lands and tenements before mentioned, to hold to Anthony and his heirs, of the king, his heirs and successors by fealty for all services. And after this grant, the king made the grant to Lowe of the manor as is before stated. Upon which this question was raised, Whether the lands first held by Lowe, of the manor of Alderwasley by knights' service, were, after the grant of the manor to Lowe, to be held by him of the king in capite by knights' service, or by fealty. And it was determined that they should from thenceforth be held by fealty. This cause was learnedly argued; but as what was offered upon it would only be attended to by few readers of this work, and those probably such as are possessed of the reports of the celebrated lawyer whose authority I have cited, it would be superfluous to say more upon it here. After this, upon a contest between the king [Charles I.] and Edward Lowe, esq. (great grandson of the first Anthony) in the chancery of the duchy of Lancaster, it appearing that there was a defect in the making of livery and seisin upon the grant of King Henry VIII. of the manor and lands in Alderwasley and Ashleyhay to Anthony Lowe, and that the letters patent granting the same were therby void, the King, after humble supplication, by his letters patent, under the great seal of England and under the seal of the duchy, dated 14th April, anno regni sui 16 [Charles I.] granted to the before named Edward, his heirs and assigns the manor of Alderwasley, alias Allerwasleghe, with court leet, view of frank pledge, assize and assay of bread, wine and beer, goods and chattels of felons and fugitives, and other franchises, as amply as they were enjoyed by any Earl of Duke of Lancaster owning the said manor: to hold of the king in soccage, as of his manor of Enfield, in Middlesex, by the annual rent of £26. 10s. From which time the manor hath continued with the grantee and his descendants, and Francis Hurt, esq. is now the owner thereof. "But the present lord of the manor has here an estate which has been in his family from an earlier period that the manor, derived from his ancestors of the name le Fowne or Fawne, one of whom, William, son of Ralph le Fowne, about the time of Henry III. was a benefactor to the canons of Darley. "Edmund, Earl of Lancaster, on the 2nd of December, 13 Edward I. granted to William, son of William Fawne [William le Fowne] and his heirs, a parcel of land in Alderwasley, where the earl's chamber used to be; and a parcel of land lying between Lowdebrooke and Millbrooke; to hold by the yearly rent of 12d. and charged with the duty of sustaining the pales between Lowdbrooke and Millbrooke by the view of the earl's foresters. The earl's chamber it is probable was a seat used by the lords of Duffield, when they took the diversion of hunting in this part of the forest of Duffield frith; and I should presume it stood on the site of the present manor-house. This grant is said to comprise (inter alia) what is now called the Shyning Cliff park, which, in 2 Henry V. the homagers of the manor presented to be held by John Fawne as a frank tenant. And in 7 Henry V. John Fawne enfeoffed Ralph, son of Peter de la Pole, in the Shining Cliff, who granted it to John Sacheverell, esq. for life, with remainder to Thomas Fawne, son of John, and his heirs. The male line of the family of Fawne continued here till the reign of Edward IV. and then terminated with the death of Thomas Fawne, who was in some way employed in the service of Henry Stafford, the great Duke of Buckingham. 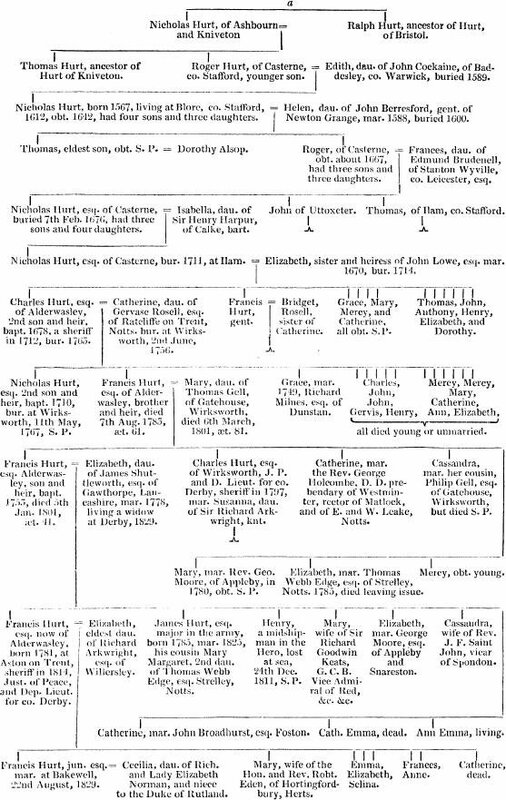 Joan, his daughter and heiress, was designed, in 29 Henry VI. to have been married to Thomas Handford, son of William Handford, of Chorley, in Cheshire, esq. In prospect of which marriage, Henry Lord Grey and other feoffees then granted to Thomas Handford and Joan Fawne all the lands of John Fawne, her grandfather, in Alderwasley and Ashleyhay, in Derbyshire: Alcester and Ordesley, in Warwickshire, and elsewhere in those counties: to hold to them and the heirs of their bodies, with remainder to Thomas Fawne, her father, and his heirs. But this marriage did not take effect [Handford dying] for on the 20th of November, 11 Edward IV. she 'in pura virginitate sua et plena �tate existens viz vigenti et trium annorum,' grants to William Sacheverell and Richard Cadman and their heirs the same estates, and these feoffees, on the 24th of the same month, granted them to Thomas Lowe, and the before mentioned Joan, in settlement. "On the 20th of November, in the sixth year of Henry VIII. the king granted to Thomas Lowe, whom he styles his servant, license to impark and impale Shining Cliff, and to make a free warren thereof, notwithstanding its being within the metres of the forest of Duffield frith. Anthony Lowe, the third son and heir of Thomas and Joan, was a servant of King Henry VII. He was also standard-bearer and a gentleman of the bed chamber to King Henry VIII. who, 22nd of June, anno 15 Henry VIII. appointed him an hereditary forester of Duffield frith; and in consequence of his having received a wound in his head in the loyal service, the king indulged him with the privilege of being covered in his presence. [16th August, 23 Henry VIII. 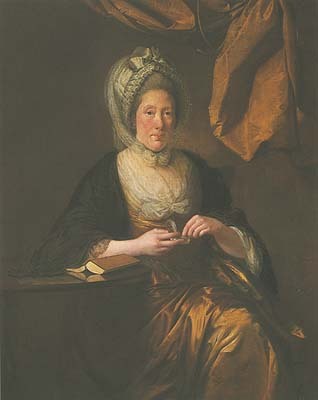 Joan Lowe, then a widow, in consideration of a certain sum of money, conveys to her son, Anthony, and his heirs, all the lands in Alderwasley that were her father's.] He was continued in the service of King Edward VI. and Queen Mary, and died in December, 1555. Bridget, his wife, was daughter of Sir John Fogge, comptroller of the household, and privy counsellor to Henry VII. and was herself maid of honour to queen Catherine. [Easter term, 1 Elizabeth, Edward Lowe, esq. levies a fine of 27 messuages, 3 water-mills, 300 acres of land, 300 acres of pasture, 300 acres of meadow, 1000 acres of wood, and 400 acres of furze and heath, in Alderwasleigh, Ashleyheigh and Wirksworth.] Anthony Lowe, their grandson, died the 23rd of June, 42 Elizabeth, seized of the manor of Alderwasley, and of 27 messuages, 5 cottages, 2 water-mills, 300 acres of land, 300 acres of pasture, 300 acres of meadow, 1000 acres of wood, and 400 acres of furze and heath, in Alderwasley, leaving Edward Lowe, esq. his son and heir eight years of age. This Edward, in the troubles between Charles I. and his parliament, was a supporter of the royal cause, and raised a troup of horse for the king, in which all his sons served; and the eldest of them [Anthony] having command of it, lost his life in the service, at Gainsborough, on the 30th of July, 1643, with Charles Cavendish (the Duke of Newcastle's lieut-general of the horse) and was buried with him at Bolsover. We are not to be surprised that the part taken by this family brought upon it the displeasure of the parliament party; and the latter being generally successful in Derbyshire, almost from the commencement of the troubles, made the Lowes feel the weight of its resentment. 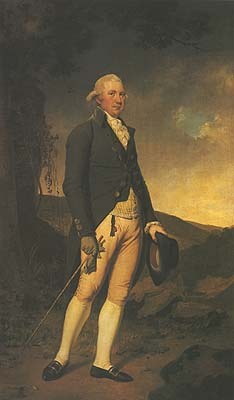 "Mr. Lowe was soon driven to seek relief from the king, whose cause he had endeavoured to assist; and he petitioned his majesty to punish his enemies by a sequestration of their estates and lands: a request which those who are acquainted with the history of the times, need not be informed was fruitless. Though, had it been in the power of the king to punish the injuries complained of, there is little reason to doubt of his inclination. Edward Lowe, of Alderwasley, esq. and his sons, John and Arthur, after these troubles, compounded with the parliament for their estates by the payment of £221. "John Lowe, esq. grandson of Edward, was sheriff of Derbyshire in 1679, and died without issue. 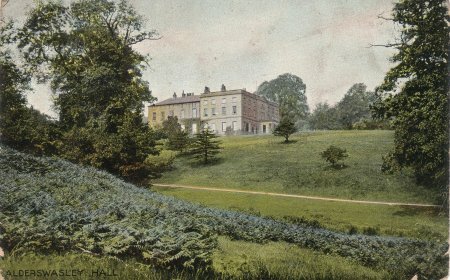 Elizabeth, his sister and heir, carried this manor and the other estates of the family in marriage to Nicholas Hurt, of Chasterne, in Staffordshire, esq. whose son, Charles Hurt, esq. was sheriff of Derbyshire in 1714, as was Nicholas Hurt, esq. son of Charles, in 1756; Francis Hurt, esq. (son of Francis) (and nephew of the last Nicholas) in 1778, whilst his father was living; which Francis, the son, was (February 1797) owner of this a manor, and of a considerable estate, viz. 3149 acres therin, partly derived from his ancestors, the Fawnes and Lowes, and partly from the purchase of his father and others of his family from Nathaniel Lord Scarsdale, and others at different periods. But that which was sold by Lord Scarsdale [A.D. 1776] had before belonged to the family of Lowe, and was given to a younger son as his portion. The Hall is a handsome and substantial built stone mansion, situate on rising ground on the west bank of the river Derwent, surrounded by hanging woods that crown the neighbouring hills. A deer park and rich lawn, adorned with venerable oaks, spread before the mansion and affords many beautiful landscapes. The gardens are well stored with excellent vineries, pineries, &c. The timber on this estate is considered equal to any in the kingdom; and trees of great magnitude have been felled. For many years past Mr. Hurt has regularly cut down timber producing upwards of £2000. per annum. The chapel is situate near the hall, and was built in the reign of Henry VIII. by the contribution of Thomas Lowe, esq. and other principal inhabitants. It is not subject to ecclesiastical jurisdiction, and has no parochial duties performed in it, nor any endowment. The Rev. Emanuel Halton is the present incumbent. Quarterly, 1 and 4, LOWE, Gules, a Wolf passant, Argent. 2 FAWNE, Argent, a Bugle, Sable, between three crescents of the last, charged with a besant. CREST. A Wolf's head, erased. * Blore's published Sheet of Alderwasley, 1797. Thank you for your swift reply, I tend to agree with you on the issue of putting private information where it's accessible to millions and not knowing what repercussions can arise. If you do get any serious and reliable enquiries please by all means do forward them to me. I do have another email address which is [ask webmaster] so you could use that also. I don't stay in Naivasha due to the nature of my work, I work for the local airline Kenya Airways as a Flight Purser, but my folks are still living in Naivasha although you may not recognise much of it after 35 years am afraid this is because of all the flower and horticulture farms almost occupying all the lake frontage property save for some few lodges and private farms, but all in all it still does go on and as a result employing thousands of ordinary kenyans who would probably be jobless. Once more my sincere thanks and best wishes for the holidays. It's been a long time since we last exchanged correspondence, I do hope that you are well and the year has gone well also. I wanted to request if you could update the Hurt family tree under our lineage and also make a slight change.